The manager slams a door and tells us that we are in a big trouble. Our old customers complain about many bugs and bad performance, new customers complain about delays and lack of dedication. And, top management considers our department financially unsustainable and wants to deeply cut expenses. The manager tells that we are brilliant programmers, work very hard and create cool software solutions. But there is something wrong and we cannot work this way anymore. Anxiety started to penetrate our souls. We know what is wrong: our team is short of people, we have too many commitments, our code is becoming a big mess, new technology and our new software version makes something bad with servers. A snowball of different problems makes us stressed, distracted and incapable of productive work. What could our manager do next? There is a third way. Place improvement practices in the core of development process. Make self-improvement inevitable and required for any activity. Do it every day. Toyota Way is the best example of large-scale reliable self-improvement process. It focuses on eliminating waste, solving problems at root cause and making right decisions. Toyota Way reduces problems, increases internal efficiency and makes a company successful. This is the best receipt for coming out of crisis. The team and managers should learn to see targets – real problems and waste. Otherwise improvements will be wild shots in the dark. It is not enough to see your targets. The Team should carry commandment to shoot targets immediately. Otherwise the best intentions will be buried under growing avalanche of problems. Even knowing problems and committed to solve them, the Team should make right decisions how to do it. Put in place solutions and counter measures. Standardize if solution is effective. The Team should find the root causes of the problems. Kaizen helps to find the root cause by repeatedly asking why the problem occurs. Kaizen forces us to overcome desire to find a first convenient explanation and patch problems without fixing root causes. By ruthlessly applying this practice, we get deeper insight into reality and better learn our product, processes, people, environment and tools. 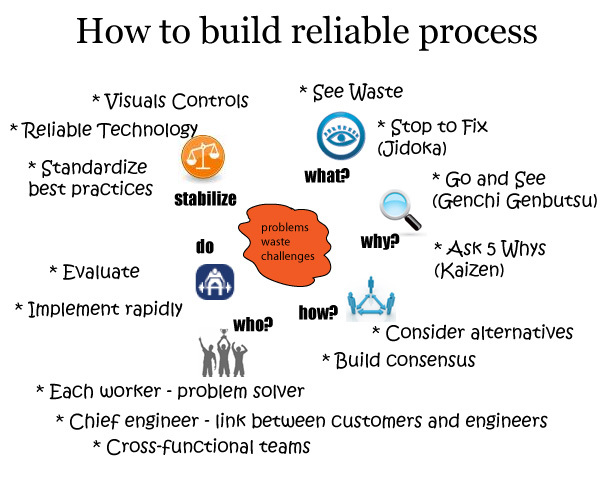 Kaizen is a core practice to see waste, solve problems and improve process. To avoid forgetting learning from Kaizen, it is important to standardize the improved process and make it a base for further improvements. Standardized work is easier, cheaper and faster – stable repeatable methods can maintain predictability, high productivity and support quality. The Team should try to use standards in many areas: project phases and activities; development practices; architecture and design approaches; code conventions; tools; programming techniques; libraries and third-party code; reuse of components and solutions; testing and so on. Standardization in software development is a controversial topic – some theorists want to bring programming closer to standard-dominated engineering, practitioners are keen to reduce standardization to minimum promoting creativity and self-organization. In the rigid interpretation, standards are “must to follow” rules for any situation, in other interpretation standards are well defined steps and guidelines highly recommended for specific context. I support the latter definition. A productive team should have standards in place to focus on customer needs instead of fighting with the same puzzles and problems over and over again. The system of standards shouldn’t be a heavy bureaucratic conduit, but a light and fluid book of knowledge. The book that contains most helpful and important rules and checklists. Standards will be effective if they are minimal, reviewed often (Kaizen) and followed by every team member. The Team should be conservative with new technologies. Software development and IT thrive on change and innovation. However, Toyota Way suggests to be conservative in adapting technology and considers stability and reliability of operations as much more important goal than keeping on the cutting edge of technology. primary goal is to improve flow and support people, process and values. In the same time encourage people to consider new technologies while looking into new approaches. If technology improves process and flow – quickly implement after thorough testing. The Team should have clear status of information. Visual controls can convey complex information in fast and efficient for our brains way. We can use controls as a user story board; status of projects, servers or code build; burn down charts and others. Simple visual indicators help people determine immediately whether they are deviating from the standards, provide quick gist of situation and direction for solving problems. People who build software are the people who should improve the process. They are directly involved and have first-hand experience of problems and waste. Toyota Way expects that each team member is a problem solver and values job experience more than theoretical knowledge. The Team will beat any external consultants and find better way to work if people are open about problems and eager to find good solutions. Chief Engineer concept is an excellent example for software technical leadership. A software team leader often lacks authority or makes too technical decisions without good understanding of customer needs. Software developers and their leaders are foundation of success in any project. Management, process and technology can only support them. And anyway, the process is as good as people follow it. Therefore, it is important to make software teams a key player in process improvements – they know problems, they understand work and they are capable to find good solutions. Can The Team revert a situation and win? Can it build the optimal process and expertise for fast development of high quality and low cost solutions? This post shows the most effective option – build continuously improving process into the heart of development. The process that focuses on quality, eliminates waste and fixes problems at root cause. I believe this approach is a foundation of long term success. Your managers and company would love it! What a fantastic introduction to the Toyota way. As someone who’s always looking for ways to optimize and improve my team’s processes, it’s great to see some formalized ways of doing so. As a practiced Kaizen facilitator with nearly 20 years of experience in implementing the lessons learnt from the Toyota Production System (TPS), it’s great to see yet another area of opportunity to apply “Lean Thinking”. I would challenge a couple of things, firstly Kaizen is a process of “continuous improvement” through elimination of non value-added activities or waste, not just the “5 Whys” method which is just one of the tools in the improvement toolbox. Secondly, bringing in someone with expertise of how to use these improvement tools and can facilitate team activities, is very valuable and they can view the processes with fresh eyes and no preconceptions. The biggest challenge is achieving the cultural change necessary for success and leadership with the vision to try something different! It would be great if you could add a retweet button in the post so that one can easily share it.